Wow, what crazy weather this is! It is a little scary that is only the beginning of spring and it is forecast to be 80F at the end of the week. I’m sure we will be paying for this in some way.. in the meantime though, I guess we should enjoy the weather and get busy gardening!! I planted my cold frame in mid Feb and have some nice lettuce mix coming up and some healthy looking brassicae transplants – cabbage, broccoli, mustard greens and kale. I also planted in my new raised bed at the bottom of my deck – I got some Japanese greens seed from a friend and so am trying that out.. The first peas I sowed at the end of February got eaten by a resident vole or mouse – hopefully with the hot weather it has now abandoned its winter home. Today was an exciting day for the chickens – we put their coop onto wheels and now can move them around the garden, so today was the first day they were moved. They seem to be enjoying digging themselves pits to sit in to keep themselves cool and to clean their feathers. I love watching them, they are very interesting and they always have something to say when I go by them. I have been using the “deep litter bed” method in their run – mostly leaves with some straw and of course lots of their poop! Occasionally I throw a little wood ash into the coop to neutralize the ammonia – this seems to keep the smell under control. So today after the move, I shoveled all their litter bed into a compost heap at the back of my new garden area. That is going to be some nice compost! I haven’t been blogging very much since I started teaching a gardening class at Northampton Community College – I am doing one per month until October. Luckily I found I love teaching gardening! I am enjoying sharing my knowledge and meeting lots of enthusiastic gardeners! This season I am also going to work part-time on a small CSA farm called Shooting Star Farm near Easton. I am working for a share in the CSA and so have decided to grow mostly storage crops in my garden. I ran out of potatoes in late January, squash in February and my onions didn’t grow so well anyhow. I still have garlic, canned tomatoes and kale in the garden. This year I decided to purchase onion plants instead of sets – they arrived last week and so I go them in the ground already. I will purchase some seed potatoes very soon. I wanted to plant them later, but don’t really have anywhere to store them under ideal conditions – probably in the basement is the coolest place right now. In the potato class I went to, the teacher suggested buying them as soon as they come in since when they are stored at room temperature they lose some vigor. My compost piles that I made last year didn’t do very much over the winter – I just moved a couple of them and they were really dry and had hardly started decomposing. I added some water and made a bigger pile, so hopefully by the mid to end of the season they will be done. I finally dug my potatoes this weekend – I was concerned about them rotting with all this rain, but they were fine and I was surprised to uncover several really large ones – both Red Pontiac and Russets. I haven’t weighed them all in yet, but I think the yield was pretty good – I have them curing in the garage since they were so wet and muddy. 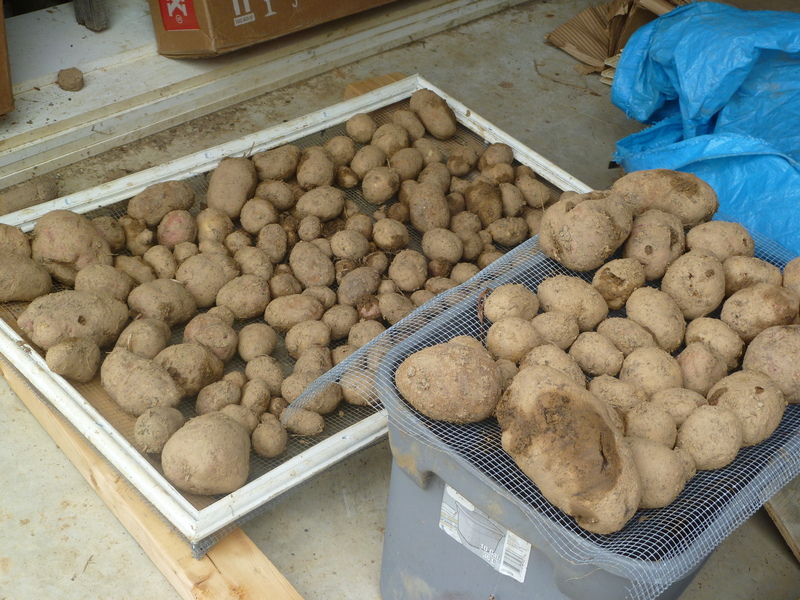 I am planning to store them in an improvised root cellar – more on that later! The beds I pulled the potatoes from will be used for the garlic planting in a couple of weeks or so – I need to add some more compost to improve the drainage and add some nutrients. Once planted, I will mulch the bed with pine needles from a friend and leave it to go over the winter. With the exception of the snake gourd (which I was growing for my son’s birthday party – which was this weekend but they weren’t ready – maybe they’ll make good Christmas presents! ), the squash plants are all but dead – the powdery mildew took them all out really quickly and effectively! Luckily, most of the fruit had set and was pretty mature, so the pumpkins are turning orange and the butternut squash seem to be ready – I didn’t harvest them since they still seem to be firmly attached to the stems – maybe they are still getting some sustenance from the stems, who knows? I do have them all resting on wood so they won’t rot on the ground. The raspberries are doing very well – now that the rains/cold weather has killed most of the wasps, the fruit is much safer to harvest! I am told they are very tasty – unfortunately I am not a fan of raspberries so I harvest them (with love) for my family (and some special friends)! I am hoping to get enough for jam (my youngest son likes to have it on his morning piece of toast), the homemade strawberry jam was sooo good I hope the raspberry jam is too. My leaf hunting will begin in earnest pretty soon – I have a new electric leaf vacuum/mulcher that I can’t wait to put into action. I am going solicit all neighbors and friends to get their leaves and mulch them up for compost. I was hoping to get one of my sons to do it, but so far not a lot of interest has been shown in the hard work department! How satisfying it was (and just a bit sweaty) to dig up 96 great heads of garlic yesterday! I had to fight through the weeds to get to them, but it was worth it! I attended the Easton Garlic Festival last Fall and purchased a bulk load of garlic – mainly Turkish Red, but also a variety pack that included German Red, Music, Elephant, French to name but a few. My son and I planted the bulbs late last October, we mulched them with pine needles and waited… I cut the scapes off in May (although some escaped – resulting in smaller heads) and treated them to some fish fertilizer in Spring and that was pretty much it – they are a very low maintenance crop! 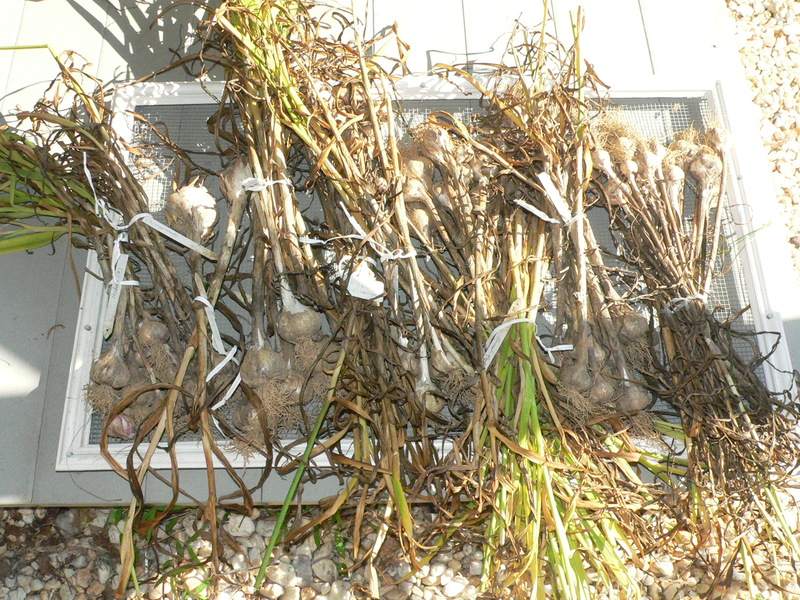 The yield was pretty impressive – about 90% of the bulbs produced full heads. (A few of them had gone too far and were splitting at the top – but I will use or trade these ones early).. I made a screen from hardware cloth and an old window frame for them to lie on to cure (out of the sun, dry place) for a week or two. This week has been hot but productive, I can last until about 11:30am in the hot sun and then I have to retreat inside – how do those real farmers do it? 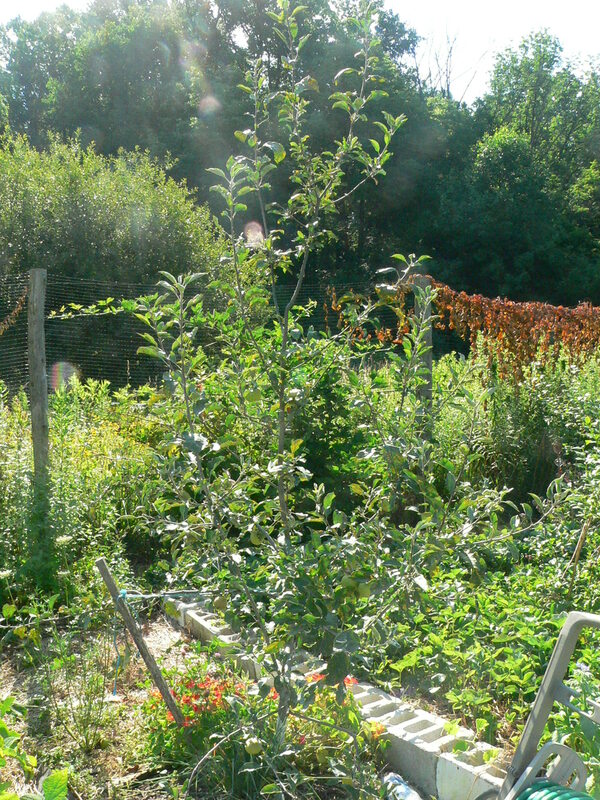 I sprayed my fruit trees with the homemade beneficial spray again – this time it included Neem and Bt for insect control as well as the usual molasses, vinegar, soap and seaweed extract. I got really annoyed though, I had purchased a new gallon sprayer and after 10 mins of spraying, the handle (on/off switch) failed and it was such a pain to keep fixing during the spraying (luckily only my dog was the only witness to the expletives being muttered!). Whilst I was dealing with the trees, I decided to prune them – the peach tree was getting a bit tall, cherry that I am training in a fan against the fence had a center branch that needed to come out, and the apple had two central leaders that I had to choose between. It was tough, but it had to be done! I started on the new raised bed for the carrots this week and also decided to where I am going to locate the new raised bed for my fall/winter produce – I thought it was going in or near the fenced garden but realized it needed to be nearer to the house (to make it more usable in the winter), so it will go by the back deck where the cold frame is currently. I think I am going to use concrete blocks to frame that out too – the ground is not level there and so I was worried about using wood or plastic lumber. I sowed some more green beans and a few peas – just to see if they would work this year (I planted them too late last year and the flowers didn’t survive the cold weather). The various squashes are doing very well so far – the butternut is flowering and we ate the first yellow summer squash last night – no signs of squash bugs or cucumber beetle this year.